It is the goal of RISD to ensure that careful planning, with an emphasis on safety, will help members of the RISD community handle crises and emergencies with appropriate responses. Every member of the RISD community shares responsibility for emergency preparedness. It is the responsibility of RISD’s leaders to ensure that individual departments have emergency plans, and to assign emergency planning and response duties to appropriate staff members. The Emergency Operations Command Team (EOCT) provides leadership and makes decisions as appropriate to respond to emergency situations. We also decide on what and when to communicate to the RISD community and provide direction to the functional incident managers and advice to the president and the cabinet. 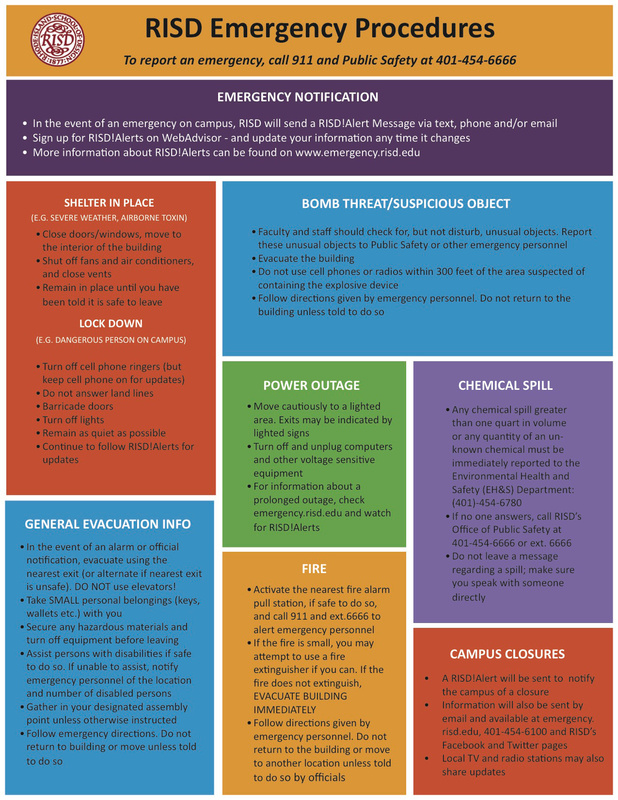 Specific policies and procedures can be found at emergency.risd.edu.